United Launch Alliance’s Delta IV rocket launched from Cape Canaveral early on Thursday, carrying a Global Positioning System (GPS) satellite for the United States Air Force. The launch was on schedule at the start of a 19-minute window that opened at 12:10 UTC (08:10 local time). The spacecraft was deployed after a multi-hour trip into space. The spacecraft, GPS IIF-3, is the third of twelve Block IIF Global Positioning System satellites, and the sixty-third GPS satellite overall to be launched. The Global Positioning System is a US Air Force programme to provide a worldwide navigation system for military applications; however the system was opened to civilian users following the destruction of a Korean airliner which accidentally flew into Soviet airspace in 1983. Today, the term Global Positioning System has become synonymous with satellite navigation, despite the advent of other systems, such as the Russian GLONASS system, and China’s Compass. Block IIF satellites are replacements for the Block IIA spacecraft launched during the early 1990s. GPS IIF-3 is expected to replace the USA-92, or GPS II-21 satellite, also known as GPS IIA-12, in slot 1 of plane A of the GPS constellation. USA-92 was launched aboard a Delta II 7925-9.5 on 26 June 1993, and has been in service far longer than it was designed to operate for, highlighting the reliability of the GPS spacecraft. Production of the IIF series began under a contract for 33 satellites in 1996, although this number was cut to 12 in 2001. The satellites are designed to operate for twelve years, and each have a mass of 1,630 kilograms (3590 lb). Compared to earlier satellites, the Block IIF is twice as accurate in terms of navigation signals. The series provides two new signals; the L5 signal for civil aviation, and M-code, a military signal intended to be more resistant to jamming. 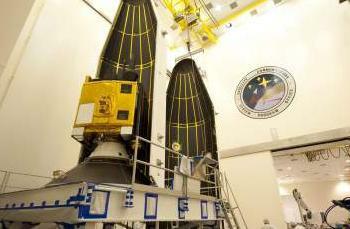 Originally intended to be in service by 2006, launches of Block IIF satellites began in May 2010. 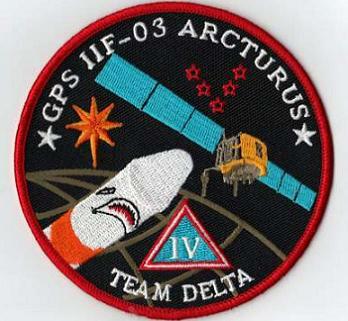 GPS IIF-3 was the third satellite to launch, following the first satellite; IIF-1, or USA-213; and a second satellite, GPS IIF-2 or USA-232, launched in July 2011. Thursday’s launch was the twenty first flight of the Delta IV rocket. The vehicle, Delta 361, flew in the Medium+(4,2) configuration, consisting of a single Common Booster Core first stage, powered by an RS-68 engine and augmented at liftoff by two GEM-60 solid rocket motors. The second stage was a four metre Delta Cryogenic Second Stage, which made use of an RL10B-2 engine. Both core stages burn cryogenic propellants; liquid hydrogen oxidised by liquid oxygen. It was the ninth flight of the M+(4,2) configuration. The Delta IV first flew in November 2002, when Delta 293 orbited the Eutelsat W5 commercial communications satellite for French telecommunications company Eutelsat. This remains the only non-US payload to fly on a Delta IV, and the only Delta IV launch to carry a commercial payload, although three later launches carried US Government weather satellites under commercial contracts. 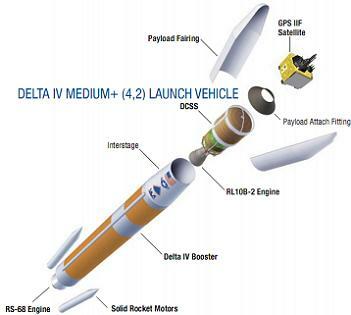 The most recent Delta IV launch was in June, when the Heavy configuration was used to deploy an electronic intelligence satellite, NROL-15 or USA-237, for the US National Reconnaissance Office. The most recent flight of the Medium+(4,2) configuration was the July 2011 launch of USA-232. Five seconds ahead of liftoff, the first stage’s RS-68 engine ignited, followed a tenth of a second before T-0 by the two solid rocket motors. At T-0, the Delta IV began its climb towards orbit, beginning a pitch and yaw manoeuvre to attain its launch trajectory eight seconds into the flight. By 47 seconds after launch, the vehicle was travelling at supersonic speed, and at 60.2 seconds it passed through the area of maximum dynamic pressure, or max-Q. Burnout of the solid rocket motors came around 94.1 seconds after liftoff, with separation following 5.9 seconds later. The next major milestone was Main Engine Cutoff, or MECO; the extinction of the Common Booster Core, which came four minutes and 5.6 seconds into the flight. Six seconds later, the first stage was jettisoned by means of pneumatic actuators. The RL10 engine’s nozzle was extended immediately following stage separation, before the engine entered a prestart sequence, and ignited fourteen and a half seconds after staging. The payload fairing separated 10.1 seconds after ignition. Three burns were scheduled for second stage flight, and the first was expected to last seven minutes and 35 seconds. This was followed by a nine minute and six second coast phase, after which the RL10 restarted for the second burn; timetabled to last three minutes and 17 seconds. The success of these burns remains unconfirmed at this time. The third and final burn was scheduled for two hours, fifty six minutes and 10 seconds later, as the vehicle reached apogee. 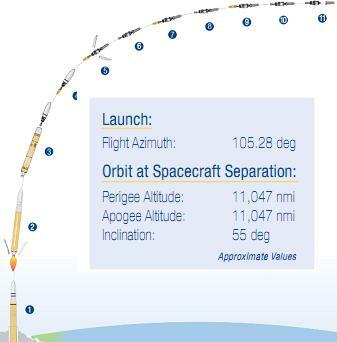 It was scheduled to last 97.9 seconds, and circularised the orbit. Its completion marked the end of powered flight. Spacecraft separation, was expected to occur ten minutes and 40.5 seconds after the end of the final burn, marking the end of a three-hour, thirty-three minute and three second launch. The target for the launch is a circular medium Earth orbit, at an altitude of 20,459 kilometres (12,713 miles, 11,047 nautical miles) and an inclination of 55 degrees. ULA note the spacecraft did make it to its required deployment position. Thursday’s launch used Space Launch Complex 37B (SLC-37B) at Cape Canaveral. The launch complex was originally constructed between 1959 and 1963, and consisted of two pads; LC-37A and 37B. It was used by eight Saturn I and IB rockets between 1964 and 1968, all of which flew from pad B. The last launch from the original complex, Apollo 5, was the first earth-orbit test flight of the Apollo Lunar Module. Following the end of Apollo earth-orbit test flights, the complex was mothballed in anticipation of a role in the planned Apollo Applications programme, however this was cut back to just the Skylab space station, and Launch Complex 39 was converted to support Saturn IB launches for that programme, and the later Apollo-Soyuz Test Project. During the 1970s, LC-37 was demolished, however LC-37B was rebuilt during the late 1990s for the Delta IV. Due to a 1997 change in terminology, the facility is now known as Space Launch Complex 37, or SLC-37. 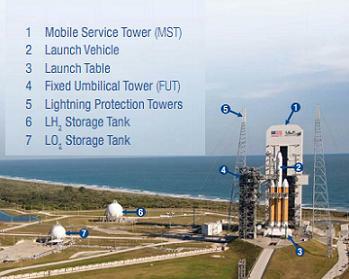 Delta 361 is the seventeenth Delta IV to launch from the complex, and the twenty-fifth rocket in total. Thursday’s launch will be conducted by United Launch Alliance, a company set up in 2006 to operate the Atlas V, Delta IV and Delta II carrier rockets, and provide launch services to the US Government. It also conducts commercial launches contracted through Lockheed Martin and Boeing and claims to have some interest in potentially launching the vehicles – likely Atlas V in the crewed configuration – from the Kennedy Space Center (KSC). Delta 361 is the fourth and last Delta IV to fly in 2012; the rocket’s next mission is planned for mid-January with the WGS-5 military communications satellite. ULA have two more launches planned this year, both using the Atlas V; one at the end of this month carrying an X-37B Orbital Test Vehicle, and another in December with the TDRS-K communications satellite for NASA.